I grew up on the mean streets of NYC, where the cops would walk 4 across. My sister and I spent our time going to school and taking care of our mother and step-father who were both quadriplegics. We lived in a housing project that reeked of urine and trash. Going in and out of our building was always an adventure. We had to avoid light bulbs tossed at us from the upper floors, explosions in the hallways, and the drug pushers and addicts. The addicts were not too hard to avoid. They were generally stoned and unconscious, lying on the floor of the hallway. We walked over their bodies to get where we needed to go. We both did really well in school and our mother and step-dad continually reminded us that there was only one way out of the projects. EDUCATION! We both did get our education. My sister is a doctor and I am a lawyer. But growing up like this leaves an indelible mark on your soul. I often joke that you can take the girl out of the projects, but you can’t take the projects out of the girl. To the rest of the world I look like a successful tax attorney. From my point of view, I am still a street rat from Brooklyn. Some things never change. During those years I went to a special high school and had to take the subway 1.5 hours each way to get to school and back. I loved my high school, but the subways of New York were dangerous back then. I was mugged many times on the subway. That is until I got a very bright idea. One of my high school classes was drafting and I learned to use a T-square, a triangle and a ruling pen. The T-square was way too big for my backpack, so I held it in my hand. One day as we were packed like sardines in the subway car, an old smelly man sidled up way too close to me. Usually I would move around to try to get away from these guys, but that day it was too crowded. There was no place to run. So I got an idea. I slammed the guy with my T-square. Amazingly, he moved away. Quickly!!! Hmmm, I said to myself. I have an idea. The T-square can keep these guys away so I am going to take the T-square to school with me every single day. So for the next three years I went to high school with my T-square. My mother watched me questioningly as I left the house with my back pack and T-square. Some days she would ask me “Why do you still carry the T-square?” I looked her square in the eye and lied. I said that “I never know when I might have to use it in school.” She knew I was lying. I knew I was lying. But she would always let me go. That T- square kept me safe and I was never bothered again. I decided then and there at the ripe old age of sixteen that when I grew up I was going to live in a place where I never had to worry about defending myself. So to make a long story short, I moved to Arizona and married an engineer/firearms instructor. Part of my job is educating anybody who will listen to me about the importance of control. Feeling safe is just one aspect of control. Owning firearms is a tremendous responsibility and another part of my job is to teach about obtaining control of our firearms. I have learned over the years that my clients with firearms are very well educated about the laws of firearms and gun safety. I have also learned that their loved ones are typically not educated at all. There is only way to insure that our firearms will be properly and safely taken care of when we are no longer able to manage them ourselves. All responsible gun owners must have a Gun Trust. A well written Gun Trust spells out to our loved ones exactly what needs to happen with our firearms in the event of our disability or death. Gun trusts insure that our loved ones know exactly what to do with our firearms safely and legally when we can no longer manage them ourselves. A Gun Trust insures that there are no “accidental felonies” in the use and transfer of our guns and accessories. When used properly, the Gun Trust also insures that our firearms can pass responsibly to the next generation. In control there is safety. My T-square protected me when I needed it. My Gun Trust will protect my daughter when she inherits her father’s firearms legacy. You see…what they have in common is safety and control. There is an old saying, “Home is where your heart is”. As we age, the idea of staying home becomes more and more important to us. I believe in this saying very strongly. However, I also believe that the physical location of ‘home’ may need to change as our needs change. While I was growing up, my younger sister and I lived with, and cared for, our mother, who was a quadriplegic. Quadriplegic means she was paralyzed from the neck down. She could not walk, she could not use her arms, and by the end of her life, she could barely move her lips. We took care of her from the time we were in grade school, until we went away to college. She got sick when I was in kindergarten and became confined to a wheel chair by the time I was in second grade. Our father had died, many years before. Caring for an individual who is a quadriplegic is not easy for an adult, let alone two young children. She was our mother and we loved her. She, despite her many physical challenges, never lost her mental capabilities, and as well as she could, she took care of us. During this time, we learned how to call the police when she fell to the floor, give her medication, take care of her personal hygiene needs, help her in the bathroom, bathe her, feed her, change her bed, cook our meals, wash our clothes, etc. We grew up too quickly. The lessons I learned were many. One important lesson was, as long as we were together, we were home. Another lesson was, I need to plan my life so that no matter what happens I can control my destiny. Now as my daughter goes off to college to begin her life, as wonderful as my mother was, I never want my daughter to have to care for me as I cared for my mother. I want to be able to control the process of my later years by living my life independently as long as I can. Then, if I lose my capabilities, I want to be in a place where the people around me can help with my personal and medical needs. There are many senior living environments and I want to choose the one that I go to. You may ask, “How will I be able to make this choice when the time comes?” The answer is simple…do it before the time comes. I have been preparing for this time of my life for many years. My mother had no money to provide for her or us. We lived on welfare and on the generosity of the people of the City of New York, to provide our home, our food, and our health care. I never want to be in that situation again. So I have saved my money and I purchased long term care insurance almost a dozen years ago. I made the purchase so that come what may, I could pay for the care that I needed. Next, I live in a beautiful home. It will be paid for in just a few years. I know, years before I need to, I will sell my beautiful home and I will move to a senior living environment. (My daughter believes I am ready right now, but that is another story to tell.) Why? The answer is easy. I want to choose where I live and the quality of the care that I receive. If I don’t make the choice before it is needed, my daughter, or some other well meaning individual will make the choice for me…most likely in a crisis. My experiences in life have taught me, rarely does one make the best choice in a crisis. Finally, I know that if my daughter visits me in her childhood home, or a senior independent living environment, home is where we are together. It is also where I am safe. She will not have to call me every day, in fear that I have fallen in the shower, and I am unable to call for help. It all goes back to CONTOL. CONTROL is a very important word in my life. I want to control all of the stages of my life, the best I can. I urge all of you to consider your choices. Make your choices early, before the crisis happens. The bricks and mortar that you cling to is not home, if it is a dangerous place for you to live. Change your destiny. Make your choices early, so you too can control, and enjoy, your golden years. Do you have a story to share from your own life experience? I would love to hear it. Just send me an email: ilene@gandmlaw.net. For more information about making the correct life choices at all of the stages in your life, contact Ilene McCauley. Ilene @gandmlaw.net or 480-296-2036. Taxpayers who gave substantial assets to family members last year could be in for a nasty surprise this tax season: potential errors on federal gift-tax returns that could result in donors owing taxes on gifts they thought were tax-free. Making matters worse, Form 709, the gift-tax return, is a potential trap for many accountants, especially when the taxpayer gave something other than securities or put the gift into a trust, as many did in 2012. Form 709 applies to gifts exceeding $13,000 in 2012. Filing incorrectly can mean a hefty tax bill for someone who expected to pay no tax on a gift at all. And an error can saddle heirs with a surprise tax bill even decades after someone made them the gift. For 2012 tax returns in particular, it is important to have someone knowledgeable handle the form, says Jere Doyle, a senior wealth strategist at the Boston office of BNY Mellon Wealth Management, which oversees $179 billion. “The problem is, you’ve got to find that person,” he says. Surprisingly few accountants have experience with more complicated reporting on a gift-tax return. Most know how to report smaller, annual gifts. But gifts of real estate or business interests—which were popular last year—or anything besides stocks and bonds, are a different matter. Graduate accounting programs used to train accountants to report more-complicated gift transactions, but some no longer do, says Steven D. Baker, an estate lawyer and accountant in Austin, Texas. A big stumbling block for many professionals is that Form 709 requires an advanced knowledge of rules for two separate taxes: the gift tax and the “generation-skipping tax,” which imposes levies that wouldn’t otherwise be incurred when families leave assets to heirs who are more than one generation younger. Yet certain estate plans can exempt these heirs from the tax. The generation-skipping tax is considered especially complex by estate planners. Contact Ilene McCauley at 480-296-2036 or at ilene@gandmlaw.net if you need any help with filing gift tax returns. Ilene is a certified tax specialist with significant experience in this area of practice. We look forward to hearing from you. Estate planning is all about control; control over our decisions and finances, both during life and after our death. After control, the second most important part of an estate plan may be the memories. Memories of the lives and experiences we have shared together. Most people, when they design their estate plan, think primarily about the large financial assets: Real property, bank accounts, investment accounts, family businesses, etc. But an experienced estate planner will tell you that the most heart-felt gifts are about the little things that end up having little or no monetary value at all. We call it “Stuff”. “Stuff” can be anything found in the home including, clothing, jewelry, furniture, family photographs and anything else which loved ones hold dear. “Stuff” becomes the physical manifestation of the love we shared. Each family is different. 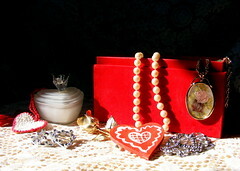 Items such as the family bible, mom and dad’s wedding bands, grandma’s heirloom hope-chest. Disputes over these items can end up costing families more in harsh words, hurt feelings, and legal fees than any expensive real estate or valuable bank account. These are items which touch the heart, not just the pocketbook. Although the family “Stuff” may have a low financial value, “Stuff” can have a high emotional value for families; a fact that many don’t consider when they’re making out their estate plans and trusts. When my mother was dying, she decided to give away all of her important “Stuff”. We are three girls so my mother divided up her “Good Jewelry” between the three of us. She also gave out some sentimental items which she thought we would each like. My gift was her jewelry box with her junk jewelry. The junk jewelry was not to my taste. The pieces were big and shiny and made of plastic. My mother loved to wear bright colors and the big jewelry matched her taste, and not mine. I told her immediately, I didn’t want the junk jewelry. She insisted that I take it. One did not disobey my mother, so grudgingly I took it. Interestingly enough, I never threw it away. The jewelry came with me to college, law school and then finally, my own home. I kept it safely tucked away in the bottom drawer of my dresser. At a point, I forgot it was there. Then one evening when I came home from work, I found my daughter Amy, then two years old, sitting on the floor in my bedroom, covered with my mother’s jewelry. She was so excited with her new treasures. She showed herself off to everyone who would look at her. Finally she asked me “Where did this wonderful jewelry come from?” I told her it was a gift to her from her grandma in heaven. She wore the jewelry during dress up time for years. Now, Amy keeps the jewelry in her bottom drawer, ready to be given to her children, whenever they arrive. The time to talk with your loved ones about “Stuff” is right now. Keep in mind that this discussion might not be an easy conversation to initiate. Just like me, most are reluctant to talk about—or even think about—your eventual passing; and many have found that they have to broach the subject more than once before their loved ones are willing to talk about it. The issue is not the “Stuff”. The issue is the thought of life without you. The answer is to prepare your “Stuff List”, today. Contact Ilene McCauley for more information about how to fill out your “Stuff List” and to answer any of your other questions and concerns. You can reach us at 480-296-2036 or at Ilene@gandmlaw.net. All children are special. The thought that a child may have to survive on his or her own before they are ready is every parent’s worst fear; it’s what keeps many parents up at night, and what brings many parents into our office asking about trusts, guardians, and estate plans. For parents of special children, the fear of leaving their child unprepared is magnified, because parents of certain children, don’t know if their child will ever be able to fully support themselves—even when they are well into adulthood. As many of you know, when I was 5 years old and my sister was 4, my father died. Not long after, my mother was diagnosed with Lou Gehrig’s disease (Amyotrophic lateral sclerosis, or ALS). ALS is a tragic, crippling disease, and my mother became a quadriplegic within 24 months. She was admitted to the hospital for years at a time, and my sister and I were shuffled back and forth, from relative to relative, because there was no one to take care of us. One of my mother’s sisters refused to take us in, and recommended we be committed to the State of New York, to foster care. We had no physical or mental challenges…but we were still special children. We were impoverished, unwanted and alone. If anyone would have told my mother when we were born that in a few short years she would be a widow and confined to a wheelchair (and later a bed), and her babies would be alone, she would have told them that they were nuts. She and my father had a huge family and she believed any one of a number of people would willingly step forward to care for us with love. Unfortunately, no one did step forward and therefore she and my father never prepared for this eventuality. As parents they had responsibilities, but they did not prepare effectively for our needs and welfare. I say this point with no anger or acrimony. I love my parents very much. They believed however, this nightmare could never happen to them. We as parents have a singular responsibility to insure that our children are cared for physically and financially, if we cannot be there for them. One way to help ensure that your special child will be taken care of—even when you can’t be there anymore—is to create a supplemental needs trust (SNL). In fact, a supplemental needs trust is almost essential for any child (or adult) who is orphaned or who may rely on government assistance for some, or all, of his or her life. As this article in the Wall Street Journal points out, the sooner you get a financial plan (and a supplemental needs trust) in place, the better for your child. A supplemental needs trust (or SNT) “typically will hold funds to be used solely for the child, usually to cover out-of-pocket costs related to the child’s care and living expenses, but the money won’t be in his or her name… and that’s important.” Otherwise the parents of the special child, like my parents, will lose control. In the hands of an experienced estate planning/special needs attorney the process of creating an SNT can be a great opportunity to anticipate your child’s lifetime needs, review your current (and potential future) assets, and plan not only for your special child, but also for yourselves in the coming years. Every child and every family will have different needs, and no two trusts will be the same. Please contact Ilene L. McCauley at (480) 296.2036 or at ilene@gandmlaw.net or ilenetaxlaw@aol.com for more information about protecting your special child. The election is over, and the people of the United States have spoken. Barack Obama has been re-elected to serve four more years as President. As a result of his re-election, we are faced with a strong division in our government. The President has expressed his views. The Senate is once again in Democratic hands and the Democrats there will support the President (subject to the filibuster (veto) power of the Republican minority). The House of Representatives is in Republican hands, and despite some losses to the Democrats, the Republicans are still in the majority in the House. Article I, Section 7 of the Constitution requires that “All bills for raising revenue shall originate in the House of Representatives.” This provision means that the Republican House must start all legislation regarding taxation. The President and the House of Representatives do not agree about what should happen next, when it comes to taxation. So what does this situation mean to Americans right now? It means that the people we have elected to power, have strongly differing views and may, or may not, be able to come to consensus about what our tax laws will look like over the next four years. The very serious problem we face, is that if the President and the Republicans do not find common ground before the end of the year, the tax laws will change automatically. The law which will come into place in 2013 will eliminate all of the Bush era tax cuts, all of the Obama era tax cuts and it will also require huge cuts to the federal government and its programs. The media calls this situation “Falling off the Cliff”. Estate and Business Planning are about CONTROL. It is difficult to find control in this situation. We don’t know what the income and estate tax structure will be next year. That being said, we know what the income and estate tax structure is NOW. Now is the time to get your assets in order, take note of any big changes in your life (either personally or financially) and get in touch with Ilene L. McCauley to update your estate plan. Consider making gifts to loved ones this year, rather than next. This year the gift tax coupon is $5,000,000 per person but it is slated to go down to $1,000,000 on January 1st. Consider some asset and tax planning protection with an Irrevocable Life Insurance Trust. Life insurance trusts allow you to leverage your gifting with life insurance and provide for your loved ones and any big tax bills later on with insurance dollars. This choice also allows you to maintain control over all of your other assets. Transfer assets to loved ones in a separate box (trust, business, LLC, FLP, GRAT, CRT and the alphabet soup goes on). The transfer gets assets out of your estate today and provides some wonderful asset protection strategies. The down side of these types of plans is that in order for you to get the asset protection, you may have to give up some or all of the control. If you have over $300,000 in an IRA or other Retirement account, consider setting up a Retirement Plan Trust. This type of trust will protect your loved ones from paying income taxes immediately upon your death and is a wonderful asset protection device. Plus, you keep total control over your IRA or other Retirement account during your lifetime. If you lost a beloved spouse in 2012, you might consider filing a Form 706 U.S. Estate Tax Return this year, even if you do not have $5 Million in assets. The Form 706 U.S. Estate Tax Return will preserve your spouse’s unused estate tax coupon. Later on, your family will be able to use your coupon as well as your spouse’s upon your death. This choice could save hundreds of thousands of dollars in estate taxes in the future. Procrastination is our biggest enemy! Get on board right now, and contact Ilene L. McCauley at 480.296.2036 or email her at Ilene@gandmlaw.net or ilenetaxlaw@aol.com. Let’s make certain no matter what they do in Washington, DC, we don’t lose control over our lifestyles or our finances. My daughter Amy turned 18 on Sunday, April 29, 2012. On Monday April 30, 2012 Amy came in to our office to sign her Last Will, Trust, Power of Attorney, and all of her health care documents. You may ask “Why? Why did I have my 18 year old daughter sign her estate plan?” The answer is one word. CONTROL. If Amy would not have signed the documents when she reached age 18, I would have legally lost my ability to get information about her health care, her finances and her education. As an estate planning attorney, I see this situation very clearly. Amy is still my “baby” but according to the law, my baby is an adult. It’s the year she graduated from high school, and its the year she will vote for the first time. I consider myself a normal parent. Most parents find it difficult to think of their new 18 year old as an adult; especially if that 18 year old is still living at home, still on the parents’ health or auto insurance, and still needs financial assistance for college, rent, or other necessities. This is why many parents (and adult children as well) are taken by surprise when suddenly school, state, and healthcare officials are no longer able to share information with parents due to privacy protection laws. Privacy protection laws such as the Health Insurance Portability and Accountability Act (HIPAA), and legal documents such as an Advanced Healthcare Directive, DocuBank or a Durable Power of Attorney may seem irrelevant to an 18 year old, but these rules and these documents should be taken very seriously by both parents and adult children. Without these documents parents may not be able to make healthcare decisions for their child in an emergency, and in some situations may not even be able to obtain critical information about a sick or injured young adult. Every adult child’s first trip to my office should be at the age of 18, when these crucial documents can be signed, and when parents and their children can discuss (perhaps for the first time) their options for medical and financial decision-making in emergency situations. This step is a vital step toward adulthood; and it’s one that can make both parents and children feel more secure and at peace as other rites of passage occur in the coming years. Please contact Ilene McCauley to set up an appointment for your new young adult. You can reach us at 480-296-2036 or at Ilene@gandmlaw.net. In 2010, Congress and the President raised the lifetime gift tax coupon (exclusion) amount from $1 Million to $5 Million. We estate planning attorneys and our client families rejoiced! We now had an estate planning coupon which made sense. The new coupon would protect most Americans against the ravages of the Estate, Gift and Generation Skipping Transfer Taxes. By taking the enormous tax bite out of the equation, we were now able to plan based upon CONTROL, rather than taxes. We counseled our client families that they would now be able to give reasonable gifts to children or other loved ones and still be able to save millions of dollars in taxes at the same time. But after all the rejoicing, the unsteady economy and Congress’ inability to act, has made many Americans cautious. Our client families are thinking twice before giving away wealth that they may need themselves in later years. Families and loved ones who want to take advantage of the gift tax coupon, but who worry that their children or other loved ones may not yet be ready to handle such a large financial gift, do have options. As the article points out, “Many [families] are setting up special trusts for loved ones and transferring assets into those special trusts.” This choice not only allows the assets to appreciate, but also allows families to breathe easy while beneficiaries have time to mature, before receiving a gift or inheritance. The special trusts may include relatively small, one-time gifts of life insurance in an Irrevocable Life Insurance Trust (ILIT). An ILIT provides financial security, creditor protection and secure payment of the gift in a very cost effective manner. If you think you, your family, or loved ones may benefit from taking advantage of the $5 Million coupon and one of these special trusts before the end of the year, please contact Ilene McCauley at 480-296-2036 or at ilene@gandmlaw.net. We can help you explore your options and enable you to learn more about what other choices you may have now and in the years to come. Time is ticking by. Act today!!! Probate, quite simply, is the process by which the court determines the legal property of a person who has died, and decides to whom those assets will be distributed. It sounds like it should be simple, but somehow, unfortunately, probate is hardly ever simple. Even in the best of circumstances there are procedures that must be followed to the letter, and the actual process (depending on the size of the estate and the laws of the state in which the property is being probated) can take anywhere from 6 months to a few years! If just reading the above takes your breath away, imagine having to organize and execute all of those steps—and possibly more! The good news is that if you find yourself serving as executor of a loved one’s will or estate, you don’t have to go through the process alone. Our office can help you navigate the tangled probate maze from beginning to end—from filing the first court documents to protecting your eventual inheritance—ensuring that your probate experience goes as quickly and smoothly as possible. Don’t hesitate to contact us and find out what your first (or next) steps should be. Ilene L. McCauley and Frederick H. Goldinov are licensed to practice law in the State of Arizona. The law firm of Goldinov & McCauley, PLC provides legal services for clients in the State of Arizona. The information provided on this website and our blog is general and educational in nature and should not be construed as legal or tax advice, nor does the use of the website create an attorney/client relationship. Laws of specific states or laws relevant to a particular situation may affect the applicability, accuracy or completeness of this information which cannot take the place of one-on-one personal legal consultation and advice. Federal and state laws and regulations are complex and subject to change. No legal representation is created, and we make no warranties with regard to the information or results obtained by its use. Neither the authors nor anyone forwarding or reproducing this work shall have any liability or responsibility to any person or entity with respect to any loss or damage caused, or alleged to be caused, directly or indirectly, by the information contained in this website or blog. What Does Back to School Have to do with Estate Planning?